In May 2014, Zochrot—a radical Israeli nongovernmental organization (NGO)—was the focus of widespread mainstream media coverage featuring its iNakba mobile application (app). Articles on the app and Zochrot were published in The New York Times, The Washington Post, Haaretz, The Christian Science Monitor, Time Magazine, and several prominent blogs. Most, including The New York Times, promoted Zochrot's agenda while others, such as The Washington Post, included some criticism. Zochrot was founded in 2002 with the aims of "rais[ing] public awareness of the Palestinian Nakba" and promoting the recognition and realization of the "right of return" of Palestinian "refugees" to places that are now part of the state of Israel. Needless to say, this supposed right is irreconcilable with any peace process based on the two-state solution, officially endorsed by many governments, and is "tantamount to destroying Israel through demographic subversion" (to use historian Efraim Karsh's words), though "in addressing non-Arab audiences, Palestinians have been less than genuine about their objectives, presenting this 'right' as humanitarian, as grounded in international law and as a long-overdue redress of historical injustice." Initially estimated at 600,000-750,000 individuals, the Palestinian refugee status has been uniquely perpetuated for over six decades and now comprises more than five million people, including second and third generation individuals. As funding has increased, Zochrot has been able to expand its activities and impact, particularly outside Israel. In 2012, Zochrot and Badil (a radical anti-Israel organization, whose Swiss government funding was frozen following the publication of an anti-Semitic cartoon), organized a joint study visit to Cape Town, South Africa, "to learn from cases of expulsion and return." 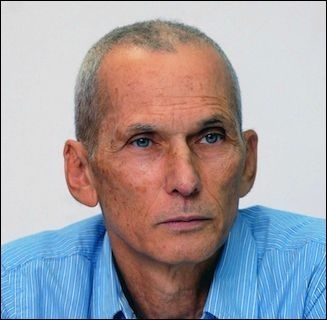 In 2010, Zochrot endorsed the militant "Free Gaza Flotilla," which used the pretense of humanitarian aid to attempt to breach Israel's naval blockade of Hamas. In a December 2008 joint submission to the U.N. Human Rights Council for Israel's periodic review, Zochrot falsely accused Israel of ethnic cleansing and "forcible displacement and dispossession of the Palestinian people." These campaigns, along with unsubstantiated allegations cited by journalists, academics, diplomats, political leaders, and legal officials condemning Israeli policies, reflect the power of NGOs such as Zochrot in reinforcing the distorted Palestinian narrative. Confederation" by Jeff Halper, director of the Israel Committee against House Demolition (ICAHD). Halper had previously stated that it was "impossible to have a Jewish state" and that a bi-national state was the only remaining option resulting from Israel's "futile attempt to impose an apartheid regime." Haaretz and The New York Times presented the app in a highly promotional manner. Haaretz described iNakba as "a new mobile app to help locate Palestinian villages destroyed since 1948," launched "to coincide with Israel's Independence Day." The use of "destroyed" clearly portrays Israel as the aggressor, and the Palestinian narrative as deserving of "help." The Haaretz article also stated "'i' in iNakba … is also 'I' as in information" and "maps are a political tool." Haaretz endorsed the app as a practical, information-based aid for refugees to recreate the past, stripping the Nakba of any historical context. The 1948 war and the Nakba claims have been widely debated in Israeli academic, political, and public frameworks, including in publications of historians such as Benny Morris, Yoav Gelber, and Efraim Karsh. This important dimension is mostly missing in the media reports, which largely repeat Zochrot's version. In the 2012-13 period, during which the iNakba app was developed and the public relations strategy prepared, Christian Aid UK, Broederlijk Delen, Misereor, Trócaire, and ICCO provided the most substantial funding. 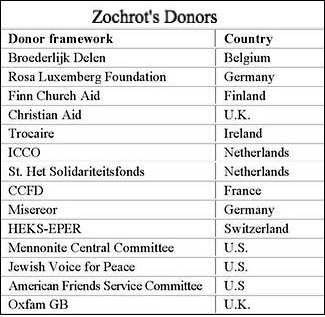 Anti-Israel, church-affiliated European aid groups often work together. In October 2012, twenty-two NGOs, including Christian Aid, Broederlijk Delen, Trócaire, and ICCO released a report, "Trading Away Peace: How Europe Helps Sustain Illegal Israeli Settlements." The report repeats the BDS agenda, calling on the European Union and national governments to wage political warfare through various forms of economic sanctions on Israel. Christian Aid issued a call for legislation to ban the import of goods to the U.K. from Israeli settlements. Similarly, ICCO called on the Dutch government "to be playing a more active role in putting pressure on the government of the state of Israel." And among other activities, Trócaire published "Sustaining Injustice: EU trade with Israeli settlements in the occupied Palestinian territories" and joined a campaign calling for the suspension of trade agreements and Israel's accession to the Organisation for Economic Cooperation and Development (OECD). when they are actually partisan purveyors of a false historical narrative and executors of a political warfare that has reinforced Palestinian rejectionism and made peace ever more remote. Efraim Karsh, "Palestinian Refugees: The Right of Return," review, Middle East Quarterly, Fall 2003. Anne Herzberg, NGO Lawfare: Exploitation of Courts in the Arab-Israeli Conflict (Jerusalem: NGO Monitor, Dec. 2010). 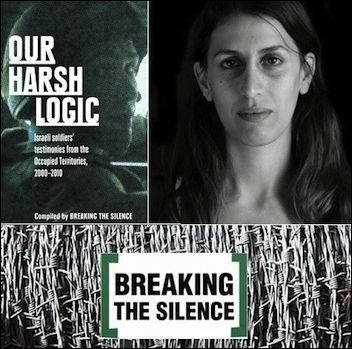 Jodi Rudoren, "Navigating Lost Villages in Israel," The New York Times, May 13, 2014; The Washington Post, May 14, 2014; The Christian Science Monitor (Boston), May 15, 2014; Haaretz (Tel Aviv), May 5, 2014; Agence France-Presse, May 5, 2014; Time Magazine, May 6, 2014. Related Topics: Antisemitism, Israel & Zionism | Gerald M. Steinberg | Winter 2015 MEQ receive the latest by email: subscribe to the free mef mailing list This text may be reposted or forwarded so long as it is presented as an integral whole with complete and accurate information provided about its author, date, place of publication, and original URL.